With age, our faces begin to lose depth and definition. The smooth volume you enjoyed in your youth starts to fade into harsh lines and wrinkles making you look much older than you feel. Our Dallas facelift patients can regain the facial vitality of their youth and face the world with confidence. To schedule your facelift consultation with our board-certified plastic surgeon, please contact the Cosmetic Surgical Center online or by calling (972) 392-3511 today. 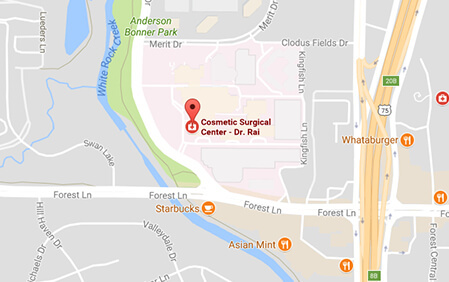 Dr. Rai has decades of experience helping men and women in the Dallas area achieve optimal results through individualized facial rejuvenation techniques. Our Approach to Total Facial Enhancement is based on evaluation of face in its entirety and face’s sub components. Our approach to each facelift is unique and different in all our own facelifts. No two faces are alike and thus no two facelifts are alike. Face can be evaluated in three parts. Upper 1/3, middle 1/3 and lower 1/3. Upper 1/3 of face is an area between hairline above and eyebrows below and incudes temples. Generally, a combination of forehead lift surgery with Botox treatments will be needed to rejuvenate upper 1/3 of face. This will improve forehead and arch of eyebrows. While endoscopic forehead lifts will suffice in patients in their 40s, open forehead lift will be needed in the older age group. Patients who had endoscopic forehead lifts in their 40s are still likely to need open forehead lifts when they reach their 50s and 60s. Endoscopic surgeries are more conservative, but also limited in their scope. Open forehead lifts provide better rejuvenation in all cases. Middle 2/3 of face encompasses area of eyelids, upper cheeks upper lip. Generally, it is part of face between eyebrows and angle of mouth. Liposuction of cheeks and buccal fat pad removal is done to make middle 2/3 of face slenderer. Fillers, such as Radiesse are used to create fuller and uplifted cheeks. Fillers, such as Juevederm are used to fill in laugh lines and cheek creases. Lifting of tissues and restoration of their tone is accomplished with facelift. Botox treatments are done to treat crows’ feet lines. Lower 1/3 of face refers to area between angles of mouth to jawline. That is where most of facial sagging manifests and always requires facelift and neck lift for its correction. Chin dimples are corrected with Botox. Drooping of angles of lips is corrected with filler treatments to add support to angles of mouth. Your procedure can take several hours at our Dallas out-patient surgery center and most patients return home the same day with the care of a friend or family member. To discuss your personalized facelift with Dallas facelift surgeon Dr. Rai, call (972) 392-3511 today or contact the Cosmetic Surgical Center to schedule your consultation. Read Dr. Rai’s blogs about Facial Surgery and Facelifts. Medications that have the potential of increasing your risks with anesthesia and surgery need to be avoided before your surgery. Some medications can lead to bleeding during and after surgery. These should also be avoided. Examples of some of these are Aspirin, NSAIDs (Ibuprofens), Advil, Naproxen. Coumadin, Plavix and other blood thinners also need to be stopped. Some routine prescription drugs cause adverse interactions with anesthetic agents and drugs. Thus it is important that you share your medical history and prescription drug history with your plastic surgeon to get proper guidance. Skin preparation is important. Avoid anything that causes irritation of your facial skin such as tanning, peels, and trying new makeup during the period leading up to your surgery. Exercise should not be resumed after your facelift until you have sufficiently healed from your surgery. Too much exertion or maneuvers that increase facial pressure can lead to post-operative bleeding. The exact time that a patient will need to avoid strenuous activity will be determined by the extent of their own surgery. In general, most patients will need to take it easy for at least 3 weeks after their surgery. Most patients will be able to resume full, unrestricted exercise regimens at about 6 weeks after their facelift. HOW OLD DO YOU NEED TO BE FOR A FACELIFT? Age should not be a criterion to look your best, ever. Thus, a facelift can be undertaken at any age where there is a potential to benefit your appearance. Age related facial changes start as early as 30. However, early changes can be remedied with non-surgical options such as fillers and Botox injections. It is not usual to need a facelift until you turn 40. We recommend starting early and keeping up your good looks with periodic touchups as and when they are needed. Thus you always look your best regardless of your age. HOW DOES A FACELIFT EFFECT THE NATURAL HAIRLINES? Facelift surgery requires careful maneuverings around hairlines to prevent irreversible loss of the hairline features. If not done by a well-trained, experienced plastic surgeon, facelifts can lead to irrecoverable loss of sideburns, stair step deformities in your hairline, or permanent loss of scalp hair. Preserving important hairline attributes requires careful surgery and an understanding of surgical techniques and pitfalls of wrong moves. That’s why it is important to choose your surgeon well. Early changes of aging in the face may be effectively corrected by relatively limited surgical intervention. This can be termed a mini facelift. A mini facelift is not a different operation. It is just a lesser degree of the same operation. Liposuction has its unique role in facial rejuvenation surgery. Its role is sculpting. Small diameter liposuction cannulas are used as surgical brushes to sculpt excess fat away from fat deposits in the face. Liposuction is done to reduce the fat of the cheeks, jaws, and neck to improve facial contour. It can be done at the same time of the facelift or as standalone undertaking without a facelift. The buccal fat pad is present in infants to help with suckling. It is an encapsulated fat pocket that overlies the suckling muscle (Buccinator). This fat tends to atrophy and get smaller as babies grow. However, some part of it always remains. Buccal fat pads can be removed to reduce cheek fullness through incisions inside the mouth. This leaves no appreciable scar on the face. Some patients, especially young patients, have a sagging of the neck only without facial sagging. In such cases doing a neck lift will suffice. A skilled surgeon will always limit surgery to address areas that need surgery. Conservatism is the best approach. Certainly. Other cosmetic surgeries that do not pose health and safety risks to patients can be done at the same time as a facelift. Many patients will choose to have tummy tucks or breast surgeries at the same time as they have their facelift. It varies in each case. Although a facelift corrects changes of aging in the face, it does not stop aging itself. With the passage of time facial sagging recurs. At that time another surgery will be needed to freshen up the facial appearance. Periodic small touchups are recommended to fix changes as and when they recur. The expertize of your surgeon counts for all plastic surgeries including facelifts. Surgeries should not be cookie cutter undertakings. Each surgery is different in each patient depending on their unique need for it. It requires instinct, art, and expertize to do it right. Look for it in your surgeon. You will find it at the Cosmetic Surgical Center of Dallas. I feel much, much better. I can’t believe how much better I feel about myself when I look in the mirror. I can wear less makeup since I’m no longer trying to camouflage a problem. Most of my friends know and like the results, two people who did not know told me I looked ‘great’. The healing process took longer than I thought, but the results are worth it.